Not even close to the Bangles original but a decently good effort. Buena versión, pero inferior a la The Bangles. Good cover, But like BZ & BB, The Bangles is better. It's an enjoyable listen at least. I think I prefer this to the original but that's probably due to familiarity more than anything. The production has grated on me in years past but I can appreciate this as a solid cover now. 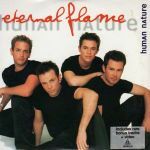 Wat slome cover van Human Nature uit 1999 van de fantastische hit van The Bangles uit 1988. It could've been worse but it's still rather unremarkable. They don't butcher it but the mum/boy band treatment doesn't come close to the original performance by The Bangles imo. Shouldn't have gone top 10.